Many mothers can only dream and wonder about what the world of their little unborn baby looks like. But ultrasound photos are an exciting way to get a glimpse of the life growing inside the womb. One mom had no idea how prescient the photo she had of her unborn child would be. 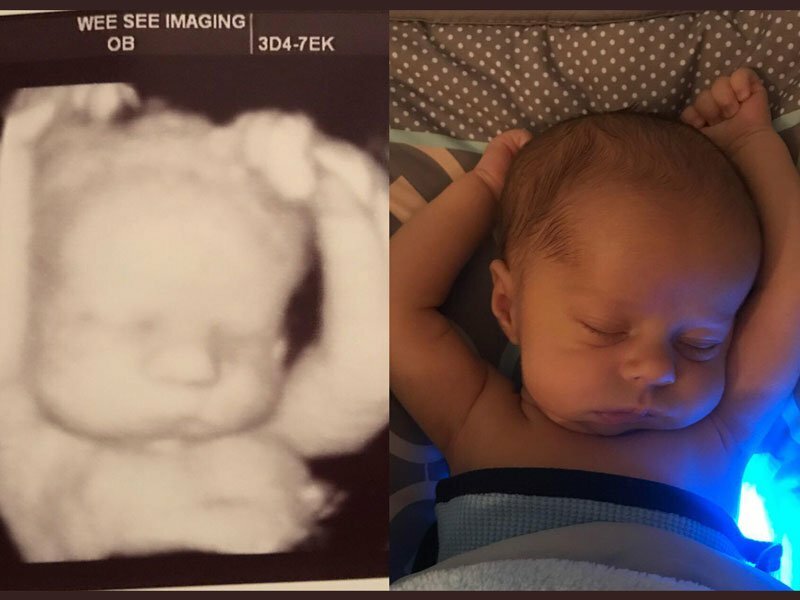 Sarah Kelleher Steppling from South Carolina decided to take an ultrasound photo after her mother and grandmother insisted they wanted to have pictures of the little preborn baby Michael. The ultrasounds revealed the baby boy having a relaxed sleep with his both arms raised over his head. Sarah was thrilled to see her baby’s beautiful face and little did she know how much he likes to relax in that position. Not long after her 38 weeks ultrasound, Steppling gave birth to baby Michael. In the following weeks, she realized that her son was still sleeping in the same position as he did in the womb. But not only the little guy likes to throw his hands above his head when he goes to sleep, he also enjoys putting a hand behind his head when he’s nursing. A hilarious habit that has delighted his mother and everybody who saw the shared photos. Michael’s parents say that they feel very lucky and that they are looking forward to seeing how Michael will slowly discover the world around him and try to remember that all this good humor could run out at any time!